In our business division of sensor systems we develop, manufacture, and distribute sensors for reliable glass handling. The requirement of reducing production costs while keeping quality constant demands new tools for reliable glass handling. Also the increasing level of automation in many stages of glass processing, as well as increasing legal requirements demand new sensors. 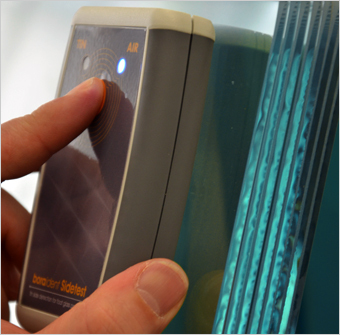 boraident offers optical sensors for plausibility checks in glass material. Most of them are developed for integration into the automated process line. Furthermore, we are using our broad experience in the field of glass marking to develop chemical sensors, which are used as check markings and ensure legal certainty in specific manufacturing steps.